This post will delve into what is becoming known as “the myth of multitasking.” Multitasking is a feat that is glorified in our culture. As many employers will attest, job applicants often list multitasking as a skill on resumes and job applications. As a culture, we believe that doing lots of things at once makes us very productive. Unfortunately, research is beginning to show that for most people, the opposite is true. It turns out that multitasking is a fallacy and a misnomer, a feat that is not really possible. Adding insult to injury, attempting to multitask may even be counterproductive, resulting in accomplishing less than we would if we instead focus on one task at a time. In this article we’ll explain why multitasking is a myth and provide recommendations on how to become more productive by focusing on one task at a time. It’s also important to mention that the research on multitasking of course looks at averages. It is likely that there is a very small percentage of the population whose productivity does not decrease during multitasking. However, for the vast majority of us, focusing on one thing at a time is a likely way to gain more time and increase how productive we are. In reality, the mind can only focus on one task a time. When we attempt to multitask, what we’re really doing is rapidly switching back and forth between tasks (1). As a result, the brain has to refocus every time we switch from one task to another. The net result is increased strain on the mind and less efficient and accurate work. You might be thinking, so what’s the big deal if we’re not really multitasking, anyway? Even if we’re rapidly switching between tasks instead of truly doing multiple things at once, isn’t that just semantics? Even though it doesn’t roll off the tongue as gracefully as multitasking, surely there is something to be said for rapidly switching tasks! No so, according to new research. It’s called the myth of multitasking for a reason. It turns out that when we attempt to multitask, rather than doing one thing well we end up doing lots of things poorly. There is a cost associated with rapidly switching tasks known as the switching cost. A 2003 study looked at how the interruption associated with receiving email messages affected employee productivity. They found that on average, employees checked their email every five minutes, and each time an individual stopped the task at hand to read an email it took an average of 64 seconds to resume the original task after reading and/or responding to the email (2). Based on these numbers, it’s easy to see how quickly the time consumed by switching tasks can add up. In this study, one minute out of every six was spent getting back on task. Over the course of an eight hour work day, this amounts to more than 90 minutes of lost time! And as email becomes increasingly utilized as a preferred method of office communication, that number only stands to increase. In addition to the time lost due to switching between tasks, accuracy and quality of work also suffer when attempting to multitask. When we try to rapidly switch between tasks, our ability to perform either one well suffers (3). This lines up with the general theme of this article, which we’ll expand in the recommendations section below: Pick one thing to do and do it well, rather than trying to multitask. 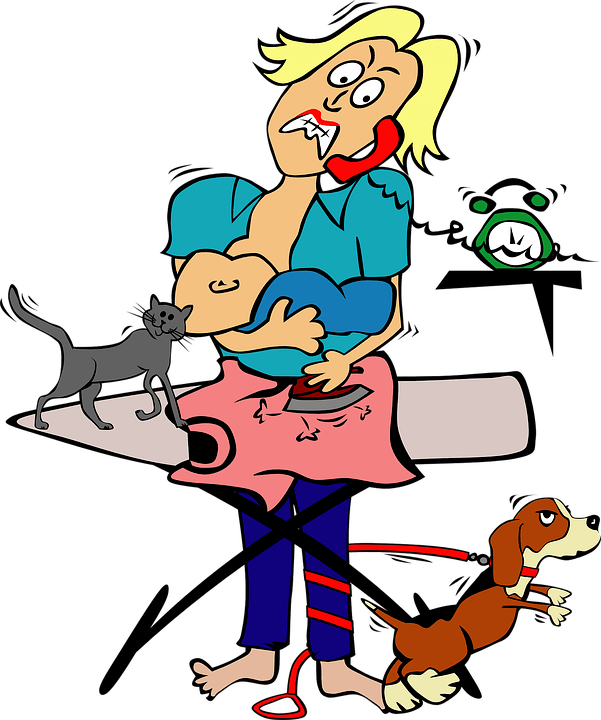 Give up on the myth of multitasking! You can test this for yourself. Grab a piece of paper and a stopwatch, or the timer on your phone. Write out the 26 letters of the alphabet and then write out the numbers 1 though 26. Note how long it takes you to complete the task. Next, attempt to multitask. Alternate between writing numbers and letters so that you write 1 – A – 2 – B – 3 – C, etc. What were your times? Most people will be able to complete the monotask exercise of writing numbers and then writing letters faster than the multitask version of alternating between the two. How much faster was the monotask exercise than the multitask version? 10%? 20%? This should give you a sense of how much time you can potentially save by focusing on one task at a time. The word priority first entered the English language in the 14th or 15th century, when it was used to refer to a singular thing (4). A person can have one priority, and everything else is not the priority. In contrast, today we talk about having multiple priorities, plural. It seems we would do well to revert back to the older, original definition of priority, which referred to one singular task or focus. Because we can really only do one thing at a time, we are doing ourselves a disservice by trying to manage multiple simultaneous priorities. It’s helpful to change our mindset from thinking about “all the things I need to do today” to focusing on one task, one priority. Once that priority is accomplished, we establish a new priority. Because we can only do thing at once, we don’t do well with having multiple priorities. We get into trouble when we have the mindset, “these are all the things I have to do today.” This makes it tempting to multitask. As we’ll see shortly, simply changing our mindset a bit can make a big difference. In the next section, we’ll get into those recommendations. But first, let’s clarify one thing. You might be thinking the assertion that “multitasking is a myth” isn’t always true. After all, it seems like there are some things people can do simultaneously, and do well. After all, you can carry on a conversation while chopping vegetables, or listen to music while driving. And you’re right. The distinction here is that you can’t concentrate on two things at once. In the above examples of tasks being performed simultaneously, at least one of the tasks in each scenario is an automated behavior or habit. Once we learn how to drive or chop vegetables, those tasks become automatic and don’t require thinking. In fact, as we learned in a previous post about habit change, they often become so automatic that we do them habitually without thinking and it actually takes concentration to reprogram a habitual behavior. So to be more accurate, although we can perform multiple behaviors at once as long as at least one is an automated habit, we can’t concentrate on two things at once. With that distinction in mind, let’s move on to the next section in which we’ll discuss how to implement better habits to be more efficient (and accurate) with our time by focusing on one task at once. It seems like multitasking should increase our productivity, but as we’ve seen, the opposite seems to be true. With the above benefits of monotasking in mind, let’s get into how to implement this in our lives. The good news is that people who are the biggest multitaskers make the biggest improvements when making these changes (2)! Our culture reveres being busy, and that feeds the myth of multitasking. We feel like if we’re busy all the time, we must be doing important work. Taken even further, we may conclude that if we’re doing important work, that must mean we are important. If some part of this rings true for you, it may be an idea worth investigating further. Take time to refine your goal. Is it to appear busy all the time? Or is it to be productive and efficient so you can accomplish more in a shorter amount of time and thus have more down time? The latter seems like a better goal, especially in our culture of overwork. Free time is a precious commodity many of us would like more of. One proven way to improve focus and concentration is to practice mindful meditation, which we wrote about last week. This can help to clear the mind and focus one’s concentration. Mindful meditation can also help reduce rumination and distraction. People sometimes have trouble prioritizing and establishing what needs to be done first, so they end up trying to multitask and work on multiple things at once. Taking time to meditate and paying attention to what thoughts and feelings arise can help refine focus and establish a priority. If, for example, you think that writing a contract is your priority but nagging thoughts about another project keep popping into your mind while meditating, that may be a clue that you have not identified your priority accurately. Set attainable goals for the day and restrict your “to do” list to a manageable number of tasks, ideally one. Identify the one thing you want to get done that day and make that your priority. You can still have other tasks on your list, such as running errands, but think of them in sequence, not parallel. To avoid the myth of multitasking, once you’re established your priority and other tasks you may need to accomplish, make a plan for your day. It can also be helpful to limit the time you spend on each task, which helps to make more progress during that time. If you know you only have two hours to work on a project you tend to be more motivated to accomplish as much as possible during that time. This is a good way to manage multiple projects. Your priority can change during the day. Establish a priority for different time blocks and focus entirely on that priority during that time. Budget time in for potential distractions that may come up during the day like responding to emails and phone calls and limit those activities to those times. While you’re focused on your priority, eliminate distractions. Put your phone on “do not disturb,” close your email application on your computer, and close out other tabs in your browser not directly related to the task at hand. Close your office door and make your intentions to focus known to others in your office. Rather than working on a priority for hours on end, establish a window of time during which you will focus 100% and then allow yourself a break. It may feel like you don’t have time to take breaks, but you may be surprised how much more time you have when you focus and accomplish a lot during that time. Is there another task that really should be your priority that keeps popping into your head? Are you having trouble concentrating because you’re hungry? Are your goals unrealistic? Maybe you need to adjust and work for shorter periods of time. Do you need to get out for a short walk and some fresh air? Do you need a meditation break? A great way to focus and be curious about what is preventing you from focusing is to meditate. We already talked about this earlier in the post. Taking a quick 10 or 20 minute mindful meditation break can go a long way to refocus your concentration and help you uncover what thoughts and feelings may be impeding your efforts. Work on striking a balance between accountability with your plan and being flexible when you need to. If the plan you’ve made is not working, use that as feedback to adjust your plan for tomorrow. With these guidelines in mind you can begin to transform your habits to be more productive and less stressed, and even have more downtime! Sometimes less is more, and this is one such case. Finally, remember to be patient with yourself. It will take time to implement and tweak new habits in your life, so give yourself time to make these changes and recognize that as you practice, you will continue to improve. If you are a person who multitasks a lot, you stand to make the most improvements but you also have the furthest to go! Rubinstein, Joshua, et al. “Executive Control of Cognitive Processes in Task Switching.”PsycEXTRA Dataset, doi:10.1037/e537272012-189. Pashler, Harold. “Dual-Task Interference in Simple Tasks: Data and Theory.” Psychological Bulletin, vol. 116, no. 2, 1994, pp. 220–244., doi:10.1037//0033-2909.116.2.220. “Priority | Origin and Meaning.” Online Etymology Dictionary, www.etymonline.com/word/priority.